The majority of colored diamonds contain inclusions because of the chemical structure and pressure required to create one. These internal characteristics are called inclusions and the external features are called blemishes. These occur in the volcanic rock where the diamond is created. Clarity, therefore, refers to the nature, color, number and size of such inclusions or blemishes. 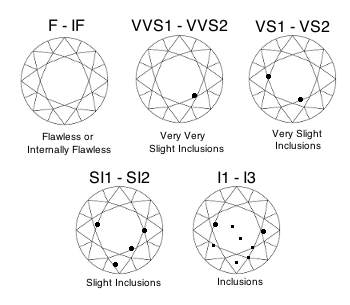 Lighter inclusions in fancy colored diamonds are the cause of significant drop in clarity grade. However, many colored diamonds are naturally included and thus standard levels of clarity and valuation are not as significant a factor in valuation. The third most expensive stone ever sold was a 0.95 carat red diamond for $926,000 per carat in 1987. This stone was heavily included but because of its rich strawberry color, it sold for a world record price. A comparable D-flawless diamond would sell for $20,000 per carat. At the Argyle tender for pink diamonds, over one third of the lots sold are I1 and I2 goods but they all sold because of the rarity of the color saturation and the beauty of the stones. It is also important to note that these blemishes and inclusions are not often visible to the naked eye and can only be seen under ten to thirty times magnification. In the trade, we refer to a stone as eye clean, or no visible inclusions to the naked eye, depending on where the inclusions and blemishes are located.